FALSTERBO, Sweden, July 10 — Anky van Grunsven gave a display of her trademark Queen of the Freestyle when she rode IPS Painted Black to victory in the Exquis World Dressage Masters Grand Prix Kür presented by Axel Johnson Group for her fifth WDM CDI5* title in two years of the richest lineup of competitions on the globe. Competing in the inaugural €100,000 (US$126,400) WDM at the Falsterbo Horse Show and her first time at this summer beach resort, Anky and the 13-year-old stallion posted a score of 82.40 per cent. The freestyle that was presented by Axel Johnson Group had total prize money of €60,000 (US$75,800) with first place earning €16,000 (US$20,200). Germany’s Ulla Salzgeber and the 10-year-old mare Wakana showed none of the spookiness from shows earlier this year and placed second on 75.90 per cent with Tinne Vilhelmson Silfven and Favourit awarded 75.40 per cent. They were the hometown favorites of the enthusiastic Swedish crowd that numbered 3,000 paid spectators and many hundreds more who crowded every available place around the arena in sunny weather with temperatures above 80 degrees (27C). Painted Black suffered a minor injury earlier this year and Falsterbo was his first competition back, but winning the €10,000 Nürnberger Versicherungsgruppe Grand Prix presented by Agria on Thursday showed the stallion was fully recovered. 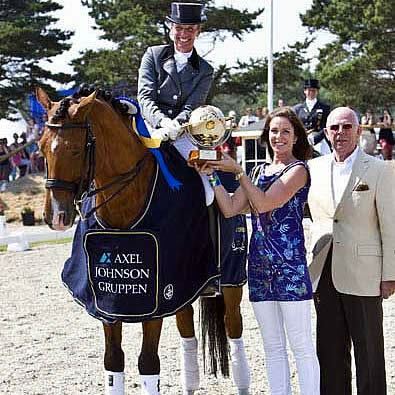 Germany’s Jonny Hilberath on Amüsant won the €30,000 Moorland Grand Prix Special Dressage Derby presented by Agria. Although Anky will not compete on the Dutch team at the World Equestrian Games in Kentucky in September, she was accorded star treatment by the crowds who filled the dressage stadium from the practice day Wednesday, the Grand Prix Thursday, the Special Friday and the Freestyle Saturday. Competition from the CSI5* jumping including the Meydan Nations Cup that was going on in an adjacent arena appeared to have no impact on the crowds. Anky, who came to Falsterbo as she usually does with her husband, Dutch coach Sjef Janssen, and their two children, was “very happy” with Painted Black despite a small error which she blamed on herself. Other riders heaped praise on the WDM Falsterbo competition — Ulla Salzgeber described it as a “little championship with fantastic atmosphere that makes the riders grow and the horses grow when they come into the arena,” while Tinne Vilhelmson Silfven said after her first WDM it was “fantastic” and hoped to participate more in the future. Antonia Ax:son Johnson, whose family company was instrumental in bringing WDM to Falsterbo, said that this year was a “pilot” program that had worked “really, really well” and would like to help bring the event back to Falsterbo next year. The final WDM event of 2010 will be at Hickstead July 28-Aug. 1, which will feature the world’s top horse and rider combinations — Moorlands Totilas ridden by Edward Gal and Jerich Parzival ridden by Adelinde Cornelissen.